Nothing better than starting the day with new paterns is not even .. learning how to do new things to improve skills and get more experience. This is what we need to be always aware of the news. I always admired my grandmother, even old she always kept up with her craftwork, both doing crochet in the hand and sewing in front of her old sewing machine, actually there were two; one for each type of work. Sometimes I think the handicrafts came as my grandmother's inheritance, inheritance from example of work and gratitude and also from satisfaction to see the final result. I know that many who are in the crochet today is because they followed the example of their grandmother or mother. So never lose that will. To give this continuation in the craft we must practice, and today I leave a pattern for you that is well known and practiced. If you already know read and practice more because the perfection of points comes from practice and if you still do not know and never made that crochet point, this is your opportunity. Start by doing new things and even better fast and easy points to later make larger and more complex patterns. The pattern available to you today is the so-called Granny Ripple which is well known. It is a beginner level pattern, that is, easy to do and the best that is a point that can do that will end quickly, so you can do many other patterns you want or more pieces of this. With this point you can make blankets, sweaters, rugs, table runners, sofa blanket among other things. You can also add crochet flowers in your piece to look more beautiful, or any design you prefer. If you are making a baby blanket, you can put in the corner a cute decorative accessory. The good thing about quick stitches is that we can make several pieces, good for those who work with sales and the more product in your store the better, so put your needle and thread to work and enjoy this spot that is beautiful. 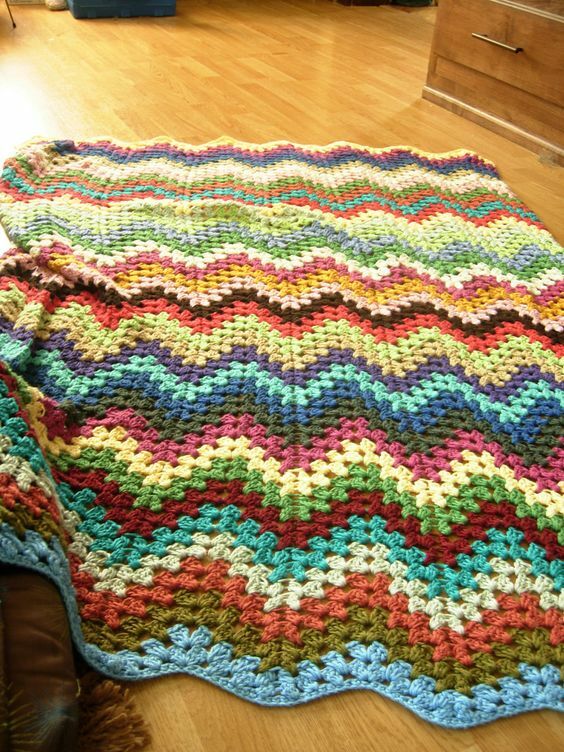 One of the crochet works that I like to do is those old and good pieces made with waves or squares, joining one another and at the end creating wonderful pieces, blankets, sweaters, cushions and anything else that you want to do or imagination to command. With just a basic square of crochet we can play with all colors and create unique designs originally made by you. One of those is the granny I brought you. Crochet is a very old craft technique, but is getting higher and higher, more and more being practiced. To make the Granny Ripple the size of the needle will depend on the thickness of the yarn you will choose to work with. The more experience you have, the faster you will make several different pieces with different color combinations. 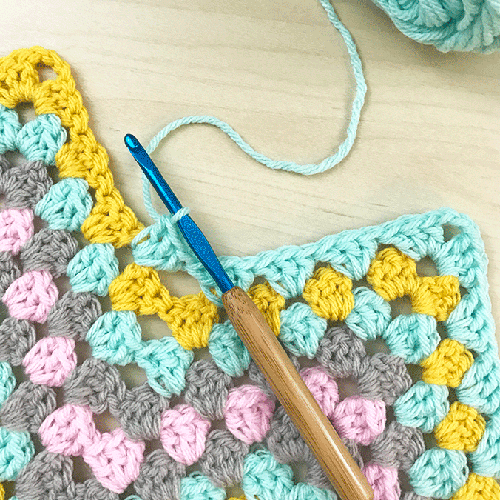 One tip is: for those who are beginning to practice crochet, it is necessary to know and train the main points that are: chain, high point, low point and low point. With these basic points you can also make other varied pieces. If you like then enjoy the crochet pattern with the tutorial that I leave for you below available for free. Do the best jobs and do not forget to enjoy our facebook page Xell Crafts until the next one.